What an extraordinary gesture from ur side. ONE OF A KIND. Thanks and Deepavali Greetings to u Sir. diwali par shaheedon ko naman.. Yes, its correct. 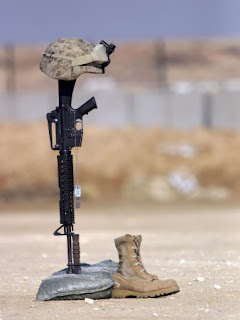 We should always remember those we lost, cause they gave their life for us. They made us in army proud. Salute to each and every one of the martyrs and their families. zara yaad karo kubani "
Heard in the capital that the benefits sanctioned to the family of Mr Rao,IFS who was killed in the first Kabul Blast is: Full pay with promotions, as pension upto 60 yrs as if Mr Rao is serving. Compare this with the benefits to the family of Brig who too was killed. It is also possible that a similar dipensation has been given to the IPS officers killed in 26/11. Wonder why we are unable to get such dispensation from the same competent authority, and why the family fending for oneself is the norm. PS: Blessings of the LORD are available to the dead, the blessings of the LIVING are not available. OCCASIONAL SALUTING AT WAR MEMORIALS remain??? That's why they say that a little knowledge is dangerous. This is a harsh rumour spread by vested interests. The CCS as well as the Armed Forces Pension Rules are absolutely same in this regard and both families have been disbursed similar (liberalised) pensions. No discrimination whatsoever. Thankfully we do not live in a banana republic.